Ninh Binh is a province in south pole of Northern Delta of Vietnam, which located about 93 km from Hanoi capital, borders Ha Nam, Nam Dinh, Hoa Binh province and South Vietnam Sea. Ninh Binh has 6 districts, 2 run cities: Tam Diep City and Ninh Binh City. Ninh Binh has a fascinating history that in 938, Dinh Tien Hoang – the first king of Dinh Dynasty – chose Hoa Lu, Ninh Binh to be the capital of Dai Co Viet after pacified 12 warlords and built a palace here. This palace always makes tourists astonished because of its acient. Ninh Binh is very lucky to be endowed a varied topography of both mountainous and coastal areas. 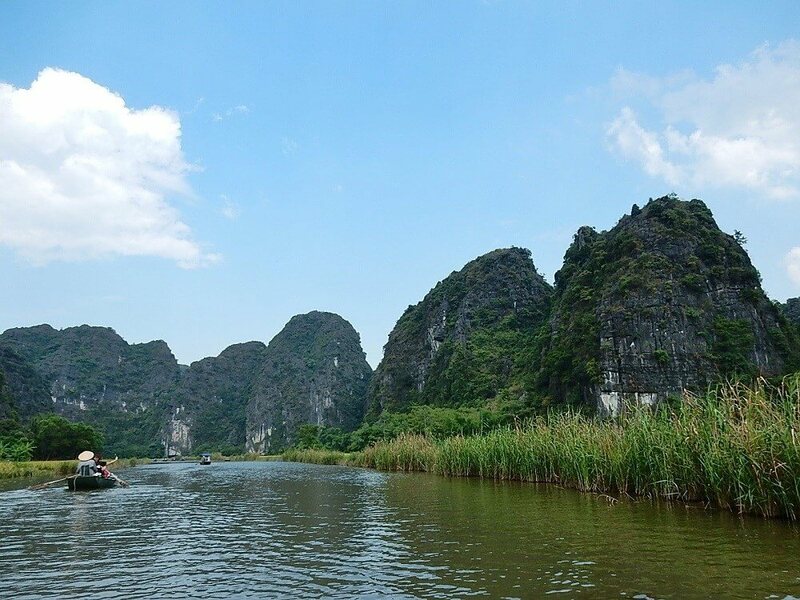 When travelling to Ninh Binh, tourists will comtemplate a peaceful landscape with vast green paddy fields,majestic mountains and endless rivers. In a small size, Ninh Binh shows us the charming unique beauty of Vietnam. The best period to visit Ninh Binh is in dry season, between November and April of the following year. Tourists can find lots of attractive sites like Bai Dinh Temple, Cuc Phuong National park, Tam Coc – Bich Dong,… and undoubtedly will have memorable moments when being here. Tam Coc is located about 7 km from Ninh Binh. Following serpentine rivers, tourists will immerse themselves in a vast green of paddy fields, trees and waters. Water surface is like a huge mirror reflecting sky, mountains,… and all appears in mystical light. The name “Tam Coc” means three grottos: Ca, Hai and Ba. Ca is the greatest and the most picturesque grotto straddle two great mountain ranges on both side of Ngo Dong River. When tourists go deep inside, they contemplate one of the most fascinating natural arts in the world. Leaving Ca cave, just turn back and see it, you can feel that it is like an old man with white-haired sitting for fishing. Getting out of the whole grotto, you can see the landscape with great mountains and endless river covering the whole wonderful land. Bich Dong Pagoda is situated in Ngu Nhac Mountain, divided into three levels: Ha Pagoda, Trung Pagoda, Thuong Pagoda. The beauty of Bich Dong is like a landscape painting, with majestic mountains, grottos and pagodas, hiding among green acient trees. “Bich Dong” means “Pearl Grotto” that totally shows us the magnificiant beauty of natural. Colors, shapes, and sounds of the shining stalactites converges in such a captivating miracle that no one could refuse to touch, knock and contemplate them in deed. Bai Dinh Temple, situated in southern of ancient Hoa Lu captital, is huge known as the temple breaks lots of records: the largest temple of Vietnam, the longest lobby with Arhats in Asia, the biggest Maitreya Buddha Statue,… About 1000 years ago, threes dynastics of Vietnam: Tien Le, Dinh, Ly all used Buddhism as state religion. Although in Ly Dynastic, Thang Long was the capital but Ninh Binh was seem to be the central of Buddhism with many ancient pagodas and temple, including Bai Dinh. Bai Dinh pagoda complex contains an ancient pagoda was built in 1136 and a new pagodas area was built in 2003. The temple is located on a ridge, among a vast vally with lake and rocky mountains. The new area has a magnificiant architecture but still imbued tradition and culture of Vietnam. The new pagoda’s architecture highlights with large cubes marks traditional architecture of Vietnam. The most difference in Bai Dinh Pagoda architecture is in dark roof of phoenix shape, it is not the same the pagoda of Chinese. Especially, the detail also carries the famous traditional handicraft villages of Vietnam. Therefore, Bai Dinh soon became an attractive site of Vietnam. Nowadays, Bai Dinh Temple is honored by the press to be one the largest temple complex in Southeast Asia.Bai Dinh Temple, situated in southern of ancient Hoa Lu captital, is huge known as the temple breaks lots of records: the largest temple of Vietnam, the longest lobby with Arhats in Asia, the biggest Maitreya Buddha Statue,… About 1000 years ago, threes dynastics of Vietnam: Tien Le, Dinh, Ly all used Buddhism as state religion. Although in Ly Dynastic, Thang Long was the capital but Ninh Binh was seem to be the central of Buddhism with many ancient pagodas and temple, including Bai Dinh. Bai Dinh pagoda complex contains an ancient pagoda was built in 1136 and a new pagodas area was built in 2003. The temple is located on a ridge, among a vast vally with lake and rocky mountains. The new area has a magnificiant architecture but still imbued tradition and culture of Vietnam. The new pagoda’s architecture highlights with large cubes marks traditional architecture of Vietnam. The most difference in Bai Dinh Pagoda architecture is in dark roof of phoenix shape, it is not the same the pagoda of Chinese. Especially, the detail also carries the famous traditional handicraft villages of Vietnam. Therefore, Bai Dinh soon became an attractive site of Vietnam. 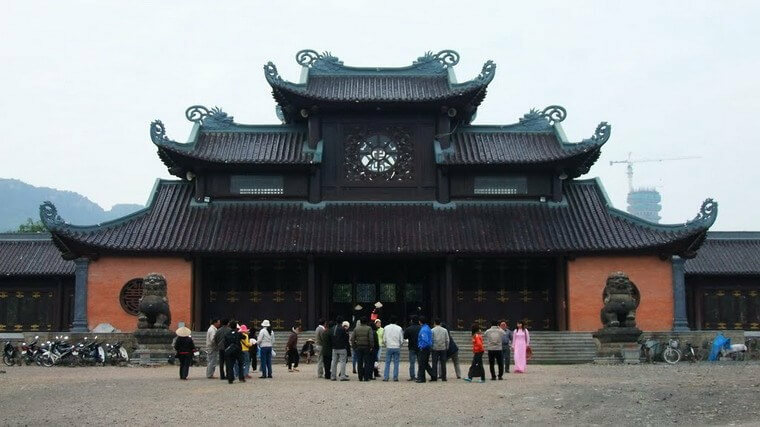 Nowadays, Bai Dinh Temple is honored by the press to be one the largest temple complex in Southeast Asia. Thung Nham Bird Park is situated deeply in vast forests and mountains, separates from residential area. 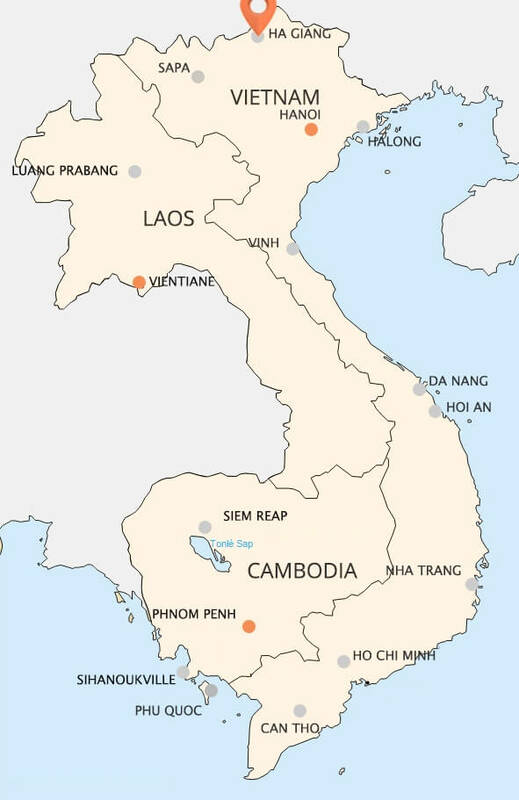 In terms of administrative boundaries, Thung Nham is located in Hoa Lu district. Thung Nham is popularly known as residence of various kind of migratory bird. Beside watching birds, travelling here, you will also complete and explore many grattos under the waters and in the mountains. The Bird Valley is covered by amazing tropical forests and majestic limestone mountains. 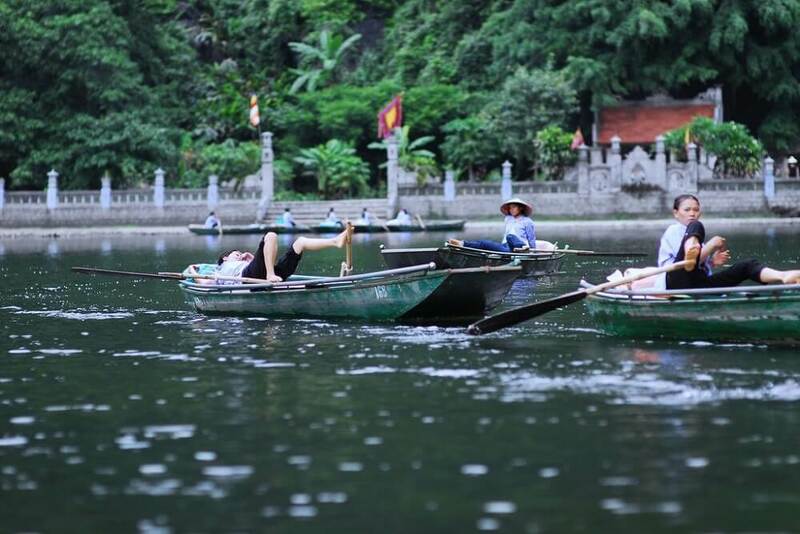 In order to visit Thung Nham, you have 2 common ways: take a boat and start your trip from Tam Coc – Bich Dong or buy ferry tickets to go straight to Thung Nham. The most attractive sites for tourists in Thung Nham is Buddha Cave. Buddha Cave is a natural cave with 500m long, about 30m high and sparkling stalactite system. Especially this cave has a Buddha shaped sitting beside underground river. There is no lights in the cave so guides need to use flashlight to show to tourists the mystical beauty of this natural cave. Tourists are also always interested in watching birds when travelling Thung Nham. The best time for this activity is late afternoon, after foraging on, each variety of birds flies back to their nests. The sound of flapping wings in the sky, of the birds jostling for space to stand constantly make tourists to immerse themselves in the sound of nature. Trang An is the most beautiful tourist attraction in Ninh Binh convince. It was inscribed as a World heritage site by UNESCO in 2014. Trang An is located in both Ninh Binh city and Hoa Lu district and Gia Vien district, Ninh Binh province. It covers an area of 2.168ha and it’s far about 90km to the southeast of Ha Noi capital. Trang An is a spectacular landscape of Hoa Lu limestone valley, which is surrounded by Chanh River at the East, Hoang Long River at the North and Ben Dang River at the SouthWest. The limestone mountains with the height from 70 meters to 105 meters have many caves inside them. Now there isn’t no exact number of caves, but most of them are water caves, so in order to visit them, tourists must go by boat. In additions, inside this caves, there are many historical signs and antiquities, tourists will be provided information about history and culture of Vietnam. 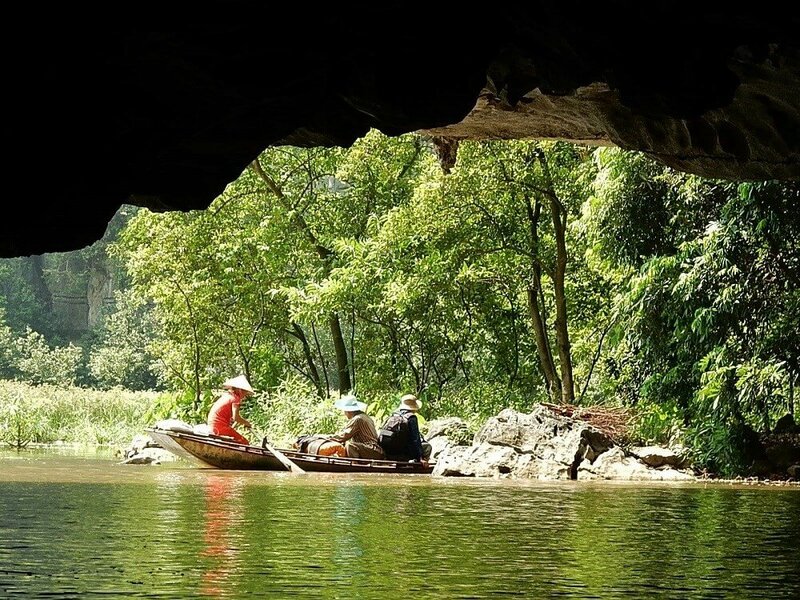 Trang An also contains other landscape as Flooded Forest Ecosystem, temple, pagoda, limestone valley, lake, rive… with many rare animals and plants, which should be conserved and some of them were recorded in Vietnam red list. All of this complex make Trang An becomes the best romantic and peaceful unique landscape in Viet Nam. If you want to find a place to relax, let’s come here and feel the peaceful and the quietness making tourists can hear the sound of mallard flapping. It will be one of the most worthy journeys you have ever had! 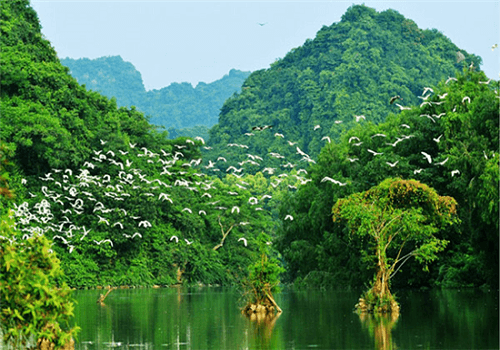 Van Long Nature Reserve, located in Gia Vien district, Ninh Binh province, is far about 90km from Ha Noi capital to the south. Although it not the only natural reserve of wetlands, it also is a famous cultural relic. This place is a huge beautiful swamp, the beauty features are build up by limestone foundation, villages and rice fields surround specially the dike is bearing typical picture of Viet Nam culture. Van Long has an area of 3.000 hectares containing 32 beautiful caves such as: Chanh cave, Ca cave, Bong cave… all of them have an unique beauty with the strange shapes of stalactite ceiling. The moutains of Van Long create a limestone mountains complex, it contains many strange name mountain such as: Voi Dung mountain, Canh Cong mountain, Hom Sach mountain, Da Ban mountain… In Van Long Nature Reserve, there are a Special Use Forest, which has over 400 species of higher plants and over 40 species of animals with 12 species of them were recorded in Vietnam red list as water monitor, lizards… When coming here, tourists shouldn’t forget to visit Temple system like Chi Le temple, Mai Chung temple… in additions, “Thi – tree” 600 years old, historic relic of Dinh Tien Hoang are also worthy places for tourists to visit. Conclusion, Van Long is highly recommended place to come for sightseeing, culture exploration and relaxing combine.